The objective of Hydrosail is to promote fast and innovative funboats - sailboats for the 21st century. Hydrosail is a trade name of the company European Hydrosail Systems BV. Hydrosail is the European dealer for the WindRider Trimaran. 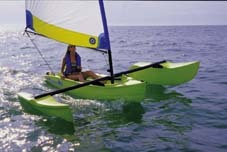 Current available models are the WindRider Tango, the WindRider 16, the WindRider 17, and the WindRider AS, AS1 and AS2 specifically for disabled sailing. Although currently not in production, we may be able to supply you with the awesome WindRider Rave Hydrofoil boat as well. We deliver boats throughout Europe, and can ship worldwide for that matter. By navigating through our site using the buttons in the menu on the left, you will get an idea of our current activities. Copyright EHS 1999 --> 2019. All rights reserved worldwide.